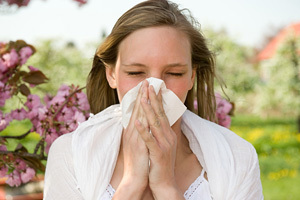 Spring allergies are no fun for those who suffer from allergy-induced headaches, coughing and sneezing. After a long winter, many people look forward to the blooming of trees and flowers in the spring, but this time of year also brings some unwanted nasty side-effects for a growing number of people. However, you can get welcome relief to the symptoms that many experience with spring allergies such as itchy eyes, congested sinuses, pounding headaches and runny noses simply by using your trusty essential oils. Some essential oils bring relief because they are anti-allergenic, whilst others help to clear blocked sinuses. This is an area where aromatherapy can be invaluable. But why do we get these allergies in the first place? An allergy is typically the body’s reaction to foreign substances, such as bacteria and viruses, which it doesn’t recognize. Although the bacteria, virus or other foreign body might not be life-threatening, the body’s immune system responds as it would to a more lethal foreign attack and this over-reaction can make the sufferer feel quite poorly. Both tree and flower pollens are common causes of allergies in many parts of the world and according to the National Pollen Research Unit here in the UK, the grass pollen count has been rising since 1999 thanks to warm springs and sufficient rains. These conditions mean the plant can operate at its optimum, so it produces more pollen. 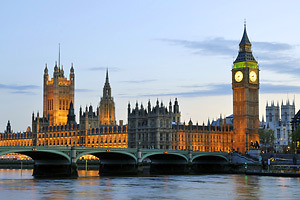 Grass pollen is the most common allergen for UK sufferers and currently accounts for over 90% of victims. The season for this particular allergen begins in late May, peaks in June and July, and eventually comes to an end in the middle of August. 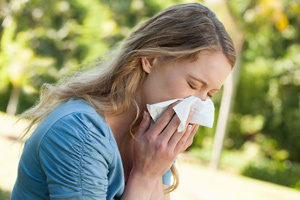 The worst time for grass pollen is usually early morning until around 10 a.m. and late afternoon into the early evening. 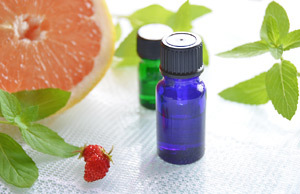 You can use your essential oils in several ways to help ease the symptoms of spring allergies. Many people find that simply inhaling an essential oil is one of the most effective and easiest ways to relieve allergy symptoms. Inhalation is one of the quickest routes for an aroma to reach and stimulate the relevant area in the brain, whilst at the same time the inhaled aroma molecules enter your bloodstream as your lungs work to oxygenate your blood. You can use this method by adding your chosen essential oils to an aromatherapy diffuser, or by placing a couple of drops of an essential oil directly onto a tissue. This is often the best way to get relief from the effects of pollen when you are outdoors or away from home, as the essential oils will work to soothe and clear the respiratory passageways. If you are using an aromatherapy burner at home add a few drops to the water bowl above the candle or, if you are using an electric vaporizer or diffuser simply add a few drops to the unit according to the manufacturers instructions. Alternatively, you can add up to 8 drops of your essential oils to a nice warm relaxing bath – and for me, this method always brings its own special type of comfort and relief. 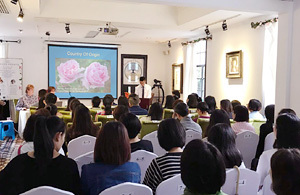 To get the best results with aromatherapy it’s usually a case of finding what works the best for you personally. Massaging the sides of the nose, forehead, temples and the back of the neck with a blend of appropriate essential oils in a carrier brings welcome relief for many sufferers, so this method is definitely worth a try. A gentle massaging action around the nose really helps to soothe those streaming eyes and mucous membranes and it’s easy to do for yourself. Likewise, if you are feeling congestion on the chest or in the head, a massage can really help since it is really reviving and refreshing due to the increase in your blood circulation. Massage the appropriate blend of essential oils (or get someone else to do it for you) over the affected area, and be sure to include the neck and face to get the full benefit. If you don’t have the essential oils listed in the sidebar, or prefer your essential oil products ready-mixed by experts, Quinessence Anti-Pollen Synergy combines several effective essential oils into one powerful and versatile treatment. Saves you money too! Allergies tend to run in families, and if one parent has an allergy then there is a 33% probability that their offspring may also inherit some form of allergy. The allergy they suffer may not be the same one as their parents have, but research has shown that Spring allergies, asthma and eczema can all have a genetic connection. 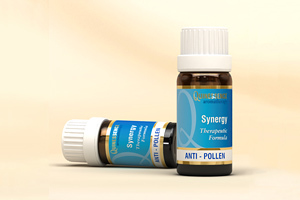 If you don't have the essential oils you need to make your own blend, try Quinessence Anti-pollen Synergy to ease the misery of hay fever. Excelent value for money, and expertly blended.